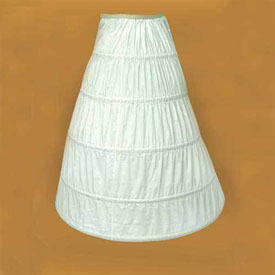 The predecessor to the petticoat, this hooped undergarment will accentuate the overall shape of your renaissance gown. The lightweight, 100% cotton fabric contains 5 metal rings, which will keep your overskirt in a beautiful umbrella shape. Rings are removable for washing. Adjustable inner band with a plastic quick-detach buckle. White. S/M or L/XL.